MONTREAL, QC – Dieu du Ciel! 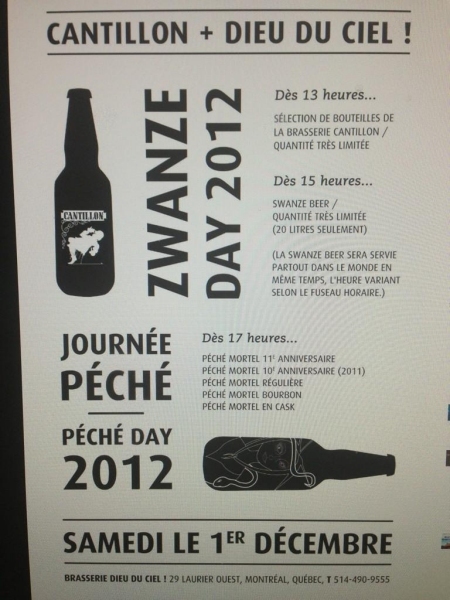 has announced that the Montreal brewpub location will once again be taking part in Zwanze Day, a world-spanning release party for an annual rarity from Belgium’s Brasserie Cantillon, and will be augmenting it with a Journée Péché, an anniversary celebration for DDC!’s flagship brew, Péché Mortel. The festivities kick off tomorrow (Saturday December 1st) at 1:00 PM when a limited selection of bottled beers from Cantillon will be opened for sampling. A single 20 litre keg of Cantillon Zwanze 2012 will then be tapped at 3:00 PM, exact moment that the rare rhubarb lambic is made available at a handful of locations around the world. At 5:00 PM, the spotlight will move over to Péché Mortel, Dieu du Ciel!’s popular coffee-infused imperial stout. Several variations will be served including a limited 11th Anniversary edition made with coffee from Nicaragua and Ethiopia, last year’s 10th Anniversary edition, bourbon-barrel aged and cask conditioned versions, and the regular Péché Mortel. Admission is free for both events, but capacity is limited, so early arrival is recommended.